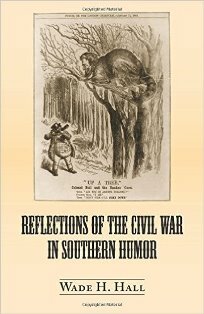 At eighty-nine pages, Wade Hall’s study of Southern Civil War humor is definitely in this category. Considering that the war was a four-year bloodbath with, sometimes, tens of thousands dying on the same day, it may even be an oxymoron. It wasn’t a naturally funny subject. But there was, of course, humor, and veteran commentator Wade Hall, way back in a section of his doctoral dissertation in 1961, had found and classified that humor and explained its uses for Southern soldiers, civilians on the home front, even the African-American slaves left behind. Now, for the Sesquicentennial, NewSouth has made this available. Hall reminds the reader that the Old Southwest Humor, written before the war by writers such as Johnston Jones Hooper, was sadistic, finding pain and suffering in humans and animals to be comic. The humor of the Civil War did not. Agony was all around and no joke. This was instead the humor of comic relief, satire, caricature, social commentary, often bittersweet, laughter and tears combined. The Union General George McClellan, famous for not sending his troops into battle, is nicely skewered in a parody of the Hamlet soliloquy. Advance or not advance, that is the question! Or to take arms against a host of rebels . . . It goes on and it works. Southern writers also had subjects closer to home. F. E. Daniel, M.D., made fun of soldiers malingering to stay away from the front lines, and other writers ridiculed draft dodgers and deserters. Officers were not immune. Sam R. Watkins wrote of officers who removed all fine lace from their uniforms, saying, “You think that I was going to be a target for the Yankees to shoot at?” Watkins replies sarcastically that minie balls and cannon balls were blind and that he always shot at Union privates since they were the ones shooting at him. Even chaplains, noncombatants, were not entirely immune, but Hall insists most men did like and respect their chaplains. Much of the writing at the time and later was through rose-colored glasses, light-hearted, sentimental, and propagandistic, often featuring faithful slaves, worried sick about their masters and devotedly looking after their mistresses back on the plantation. The works of John T. Moore and Thomas Nelson Page (In Ole Virginia) are masterpieces of this variety of gentle humor, depicting the antebellum plantation South as a Golden Age. A lot of this humor seems pretty lame 150 years after the fact. Hall is, however, the expert in the field. The quotes he includes, his bibliography, and in fact his own many studies and anthologies of Southern writers will give devotees some terrific guidance to contemporary accounts, comic pieces, and memoirs for more reading. Editor’s Note: Author Wade Hall died on September 26, 2015. Don Noble is host of the Alabama Public Television literary interview show Bookmark and the editor of A State of Laughter: Comic Fiction from Alabama. This review was originally broadcast on Alabama Public Radio.